It empower, promot self-esteem motivates students, enables them to earn better grades. Regular participation in sport and physical activity is associated with a range of physical and mental health benefits both in childhood and adulthood. Active children generally become healthy adults and schools play a key role in contributing to that outcome. Although India is not a key player of football in the world scenario,GGPS has pretty strong teams. 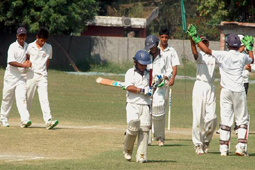 Cricket is the most popular game our country plays.GGPS boasts of having a cricket team in the campus. 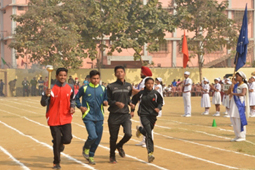 Athletics is an exclusive collection of sporting events that involve competitive running, jumping, throwing, and walking. Students are encouraged to participate in a way that suits their interests and abilities. 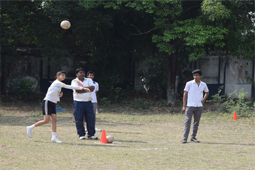 During school sport students will develop a variety of skills that will equip them for lifelong participation in regular sport and recreation activities. No other thing in life affords children such opportunity to develop positive character traits and to soak up many quality values as sports does.